A study led by researchers at the Hospital del Mar Medical Research Institute (IMIM) and the Institute of Medical Physics and Biophysics at the Faculty of Medicine in Charité Hospital, Berlin, published in the journal Nature Communications, demonstrates that the cholesterol present in cell membranes can interfere with the function of an important brain membrane protein, through a previously unknown mode of interaction. Specifically, cholesterol is capable of regulating the activity of the adenosine receptor, by invading it and accessing the active site. This will allow new ways of interacting with these proteins to be devised that in the future could lead to drugs for treating diseases like Alzheimer's. "Cholesterol is an essential component of neuronal membranes, where GPCRs reside along with other proteins. Interestingly, the levels of cholesterol in the membrane are altered in diseases such as Alzheimer's, where GPCRs like the adenosine receptor play a key role", explains Jana Selent, head of the GPCR Drug Discovery research group at the GRIB, a joint programme between Hospital del Mar Medical Research Institute (IMIM) and Universitat Pompeu Fabra (UPF). "This study has shown that cholesterol can exert direct action on this important family of proteins in neuronal membranes, the GPCRs, and establishes the basis for a hitherto unknown interaction pathway between the cell membrane and proteins", adds the researcher. Up to now, it was thought that membrane cholesterol could regulate the activity of these proteins through two mechanisms: either by altering the physical properties of the membrane, or by binding to the surface of the protein. In both cases, it was thought that cholesterol could only exercise its modulatory action from outside the protein. However, by using latest-generation molecular simulations the researchers were able to detect the fact that cholesterol can leave the neuronal membrane and get within the adenosine receptor, in particular accessing the receptor's active site. With this information, and in collaboration with Dr. Mairena Martin and Dr. José L. Albasanz from the University of Castilla-La Mancha, we designed an experimental protocol using cell assays to demonstrate that cholesterol is able to modulate the activity of this receptor by accessing its interior. "Cholesterol levels in cell membranes could have a more direct effect than previously thought on the behaviour of key proteins in central nervous system diseases. In particular, high levels of membrane cholesterol like those present in Alzheimer's patients probably block the adenosine receptor, which could in turn be related to certain symptoms observed in this disease", explains Ramón Guixà González, a postdoctoral researcher at the Institute of Medical Physics and Biophysics at the Faculty of Medicine in Charité Hospital in Berlin and first author of the article. "Although other studies are needed to prove this relationship, this work provides key knowledge that could be used in the future in the development of new molecules that, like cholesterol, have the ability to get inside the receptor and modulate its activity", says the researcher. The results from this study represent a paradigm shift in the relationship between membrane cholesterol and GPCRs in the central nervous system, and open up new avenues of research in fields where the cholesterol-GPCR relationship is essential. It also appears that the cholesterol access pathway into the receptor is an evolutionary footprint. It is therefore necessary to discover whether the molecular mechanism described in this paper is present in other GPCRs and therefore potentially involved in a wide range of central nervous system diseases. 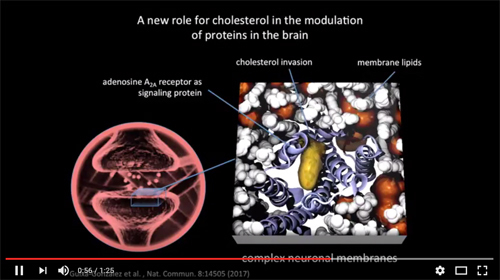 Explanatory video in which you can see how cholesterol leaves the neuronal membrane and get within the adenosine receptor.